Discovering the Child through the eyes of Dr Maria Montessori was like a spiritual awakening for our Founder, Samina Mahmood. She had to respond, not in words – but by implementation. 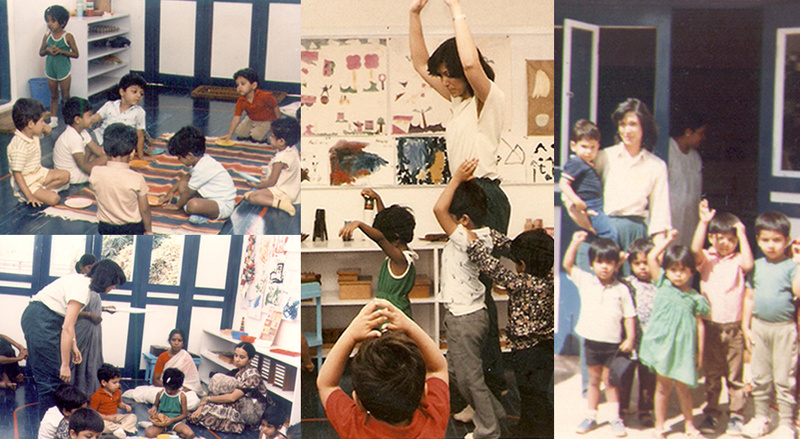 With only meagre funds available, a small garage was the first home of Head Start Montessori House of Children, and it opened its doors and its heart to children on July 4th 1984. The first learners were three little boys. The three became 20 boys and girls within a year and Head Start kept growing. Love for children and the spirit of Maria Montessori were the guiding forces and it was this love and guidance that propelled the Head Start movement. For Samina, the realisation dawned that starting and running a school is actually a deeply emotional experience. The garage became too small and Head Start moved to a house. This house also became too small and then needed one more house. The family of children and teachers worked out of two houses for a few years, calling them the Blue House and the Red House for purposes of identification; then moved out of the Blue and the Red into one big house. The big house also became too small! New skills were learnt along the way; how to pack furniture, materials and equipment several times over the years; how to set up Montessori environments in odd shaped rooms and houses; and how to make the best possible utilisation of space. Cardboard cartons were never thrown away but neatly folded and stored for future use. We never knew when we would have to move again! But we were getting tired of moving – and moving – and we had a few hundred children! With mounting pressure for admissions we started our Afternoon Session, believing that giving children an opportunity for a Montessori education was better than turning them away. In 1996 Riad Mahmood joined us as our Managing Trustee and said, ‘How long can we keep moving and moving?’ So with his determined efforts, the search for a permanent place began. Close to Head Start’s twentieth birthday our prayers were answered and we were allotted a Civic Amenity Site by the Bangalore Development Authority, in Koramangala. Resources were meagre. We struggled and fretted but avenues opened. Blessings came and resources followed. We were actually able to build our own House of Children! This was not only a milestone – it was like a huge burst of the spirit that cannot be described in words; the same spirit we felt in the little garage but magnified a million times, and shared by many, many more hearts. It was an overwhelming feeling. In 2004 our nomadic existence ceased. Our present building on CA Site 32(P), 16th Main, 4th Block, Koramangala, was ready and we moved in with joy and gratitude – we finally had our own space! Our journey with children has been deeply rewarding and beautiful. After more than 30 years in Koramangala, we are now reaching out to children in Whitefield. We continue to remind ourselves that we are a community of learners. Educators and children alike are always learning and looking for ways to discover and enrich their lives. Montessori’s belief that education is for life, not the classroom, is an inspirational thought.